POSTECH’s new rowing club, only one year old, earned medals at the 2017 Jang Bogo Flag National Rowing Championship, which took place at West Nakdong River Rowing Arena on July 1-2, 2017. In its 43rd year, the two-day event is the most respected competition of its kind in the country. POSTECH rowing club placed in second and third in Women’s Collegiate Coxed Four (4+) and Men’s Collegiate Eights, respectively. 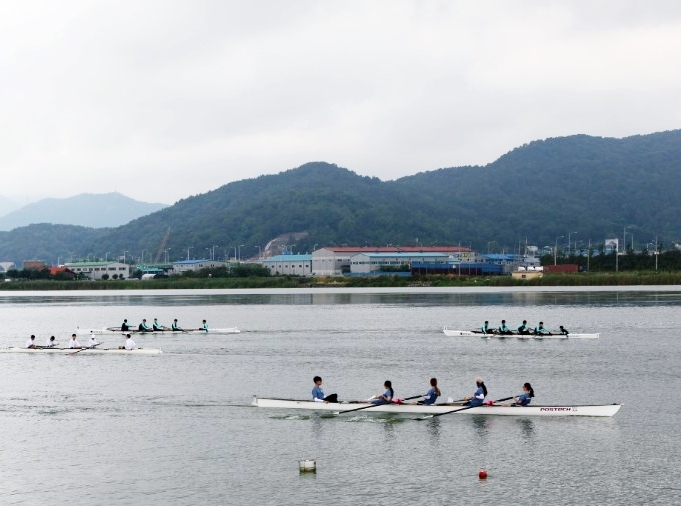 POSTECH rowing club, the university’s first official athletic team, was established in May 2016 as part of the efforts to foster well-rounded global leaders equipped not only with intelligence and moral virtues, but also with physical strength. Only after a year of training, they have achieved success at the national level competition. POSTECH will also participate in the Korea National Collegiate Championship at the end of this month. Nine universities including SNU, Korea Univ. and Yonsei Univ. will be competing for the national title. As it will be POSTECH’s debut in the competition, POSTECH is placed in the extra round and excluded from the rankings.